Adams regularly performs alongside arcade games, a stuffed tiger, and cardboard cutouts of cats. At Coachella, he brought the maze game Berzerk up with him. 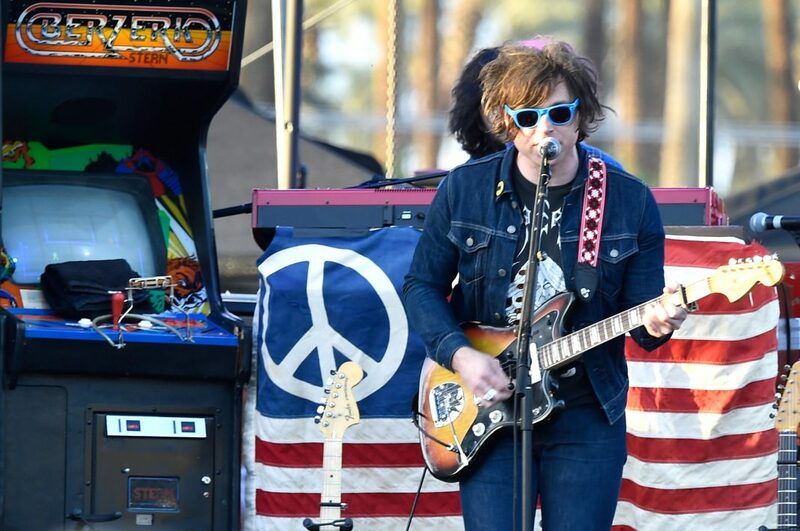 Singer/songwriter Ryan Adams is like the musical version of The Three Faces of Eve. Between his alt-country band Whiskeytown, his folk- and alt-rock solo career, and his metal and rock side projects (Werewolph and Sleazy Handshake, respectively), he makes so much music that it’s almost hard to keep track of it all. On top of that, he has a wonderful habit of covering other artists in unorthodox ways. A bluegrass cover of Black Sabbath? Sure. An alternate-universe version of a Taylor Swift album? Yup, yes, absolutely. On Friday, Adams will play the Greek Theater, likely with a set list that includes songs you love as you’ve never heard them before. It’s clear that we can’t separate Adams’s weird from his wonderful—he’s at his best when he embraces the “Why not?” side of his brain. And we can prove it. Here are ten of his most intriguing covers to whet your appetite for this weekend’s show. When Adams embarked on his song-for-song cover of 1989, it was meant to be a personal project to help him cope with a painful divorce from Mandy Moore. It blossomed into a heartbreaking, nuanced reinvention of T-Swift’s popcraft, peeling it back to reveal the darker flipside of her youthful lyrics, with all the sincerity and ache of Springsteen’s best (see: “Shake It Off”). “Style,” though, is the most uptempo moment on the album, and the confidence is infectious. This is one of the more contemplative songs in the Foo’s repertoire, so it lends itself nicely to the acoustic, teary-jerky Adams treatment. Adams cuts his vocals loose here, doing this AiC cover real justice. Few can fill the late Layne Staley’s shoes, and Adams knows it—he gives one of the band’s most melancholic tunes an ethereal groove and in the process cements it as another RA classic. Adams is an ’80s baby: The first track of his seminal solo debut, Heartbreaker, is nothing more than a good-natured argument with David Rawlings about a Morrissey song. Bruce Springsteen and Tom Petty vibes creep into his music, too. We never would’ve guessed his nostalgia would translate into a Patrick Swayze cover, but we’re not mad about it. Like his versions of Madonna’s “Like A Virgin” or Backstreet Boys’s “I Want It That Way,” he doesn’t perform this gem regularly. But he took it off the shelf last month with his bluegrass outfit, Ryan Adams & The Infamous Stringdusters, and spoiler: it rules. Don’t do it. Don’t you make a Bryan Adams/Ryan Adams joke right now. In a well-known 2002 incident, a heckler at Nashville’s Ryman Auditorium kept asking him to play B. Adams’s “Summer of ‘69.” R. Adams ordered the house lights be turned on and lobbed expletives at the guy before handing him $30 for his ticket and refusing to go on with the show until he left. In a moment of full-circle maturity and probably a little self-deprecation, Ryan covered Bryan last year at the same venue. This is arguably Adams’s best-known cover, and it’s such an excellent reimagining that Oasis’s Noel Gallagher sometimes plays Adams’s version live instead of his own. In a rare reversal of Adams’s usual MO with covers, Whiskeytown’s rendition of “Dreams” has more oomph than the OG Rumours tune. He changes a couple lyrics for no apparent reason, because YOLO. Young and Adams are cut from the same cloth: they can both captivate a room with a guitar and a solid harmony. And when Norah Jones is the one providing said harmonies, we start to wonder how we ever lived before this cover.